First, you must understand that Terry Moore is an amazing storyteller. He tells the story of ordinary people in both ordinary and extraordinary circumstances. You know people like this. Aunt Libby is the lady on the corner who lives in her own house and does not need your help, thankyouverymuch. Jet is the wild child who decided to settle down in her hometown. Francine is your sister who struggled with her weight and feelings of insecurity until she met the right person who helped her to see how remarkable she is. Katchoo? She’s your scrapper who came up from the bottom and fought and found salvation in that which others find routine or even pedantic. Once he’s created these wonderful stories, he draws and inks them. It’s an all-Moore, all the time show. Early last year, I selfishly took up some valuable time from Terry and other creators at a convention because I had a shiny new Press Pass and wanted to use it. However, I put a LOT of pressure on myself at that con, did a few interviews, attended a press function, pressed flesh, and basically did the whole “I’m Press” experience. Out of the glow of that convention, I wrote one passable review for a book I picked up and one bad transcript of an interview with another creator. Then I spiralled down into a depression that was a culmination of that pressure and other things going on in my life until I couldn’t write anything. The other people I interviewed got the idea that I’d wasted their time, and there were some subtweets that I saw and died a little from reading. I think I’ve been unfollowed if not blocked by everyone I’d interviewed because I let them down. For that, I sincerely apologize. I did not follow through on my end of the bargain, and for that I’m truly sorry. I apologize to you as well, readers, because Mr. Moore was a delightful person to interview. I found out that he likes changing hair on his characters, not so that you won’t recognize them, but because we change our hair all the time. No real person is going to have the same color and style of hair for their entire life. He also thinks that while movies and TV shows about superheroes explore the everyday lives of our heroes very well, superhero comics tend to miss out on that part. It becomes the villain of the month story instead of something that leads the reader to know more about their hero. 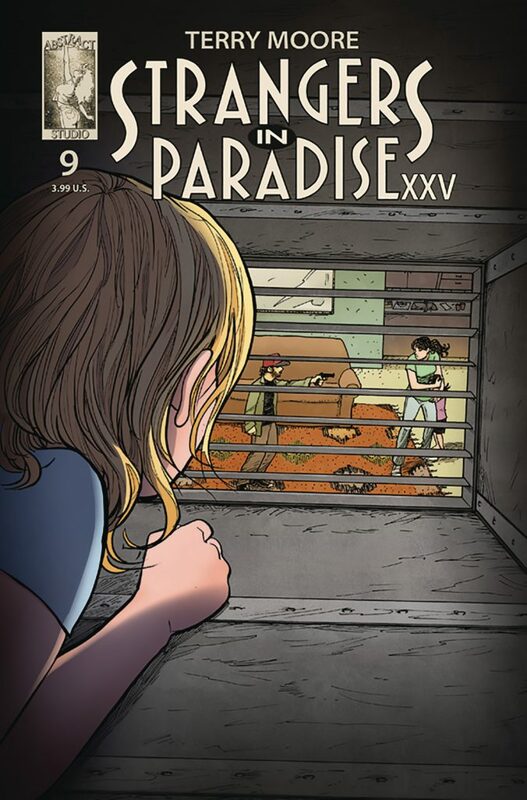 The latest issue of Strangers in Paradise XXV only highlighted that all parts of the Mooreverse – comprised of the original Strangers in Paradise, Echo, Rachel Rising, and Motor Girl – ties in to each other. Jet worked for Katchoo, but went home to the town where Rachel lives; what happens to Julie at the end of Echo is what sparks the start of SIP XXV; Sam’s landlord Libby is Francine’s aunt, and so on. Katchoo is walking a path into Rachel Rising because her family is still at risk. She meets the enigmatic Lilith, but there are still no answers to be found. Moore has been feeding us this story bit by bit, letting us savor each mouthful and find the textures that please us most as he goes. Excited to have another taste soon.